Place a rag under the fuel feed hose (1) and remove the fuel feed hose. 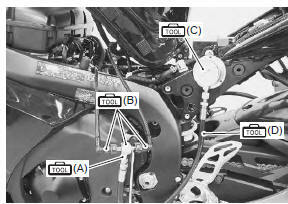 Install the special tools between the fuel pump and fuel delivery pipe. Turn the ignition on and check for fuel pressure. removing the special tools, turn the ignition switch off and release the fuel pressure slowly. Reinstall the fuel tank. Refer to “fuel tank removal and installation” .